Orange County Real Estate Lawyer Edwin Fahlen has 30+ years of legal experience helping individuals, businesses, buyers, sellers, investors, real estate agents, brokers, and commercial landlords/tenants with real estate disputes, escrow disputes, quiet title actions, partition actions, commercial lease agreements, real estate litigation, arbitration/mediation representation, For Sale By Owner (FSBO), and other real estate transactions. No need to hire two professionals! Attorney Fahlen is also a licensed Real Estate Broker. As BOTH a skilled real estate lawyer and experienced real estate broker, all Orange County real estate matters are reviewed from two experienced points of view. As a CalBRE licensed broker, Edwin has more experience than most real estate attorneys. Attorney Fahlen helps clients with the drafting and review of CAR forms; disputes between buyers and sellers as well as disputes among buyers, sellers, agents, brokers, escrow officers, and title companies. Edwin assists clients to resolve all manner of real estate sales disputes, escrow problems and real estate commission matters. FSBO (For Sale By Owner) – For those wanting to buy or sell a home “FSBO,” Edwin helps many Orange County residents save tens of thousands of dollars that would normally go to a real estate commission by assisting clients with FSBO transactions. Edwin Fahlen’s legal and real estate experience including his multiple state licenses and affiliations allow him to provide his clients sophisticated and practical advice and solutions. The typical real estate opportunity or dispute usually involves a combination of legal, financial and real estate purchase, sale or marketing issues. As an Orange County Real Estate expert, Mr. Fahlen is in a unique position to provide his clients practical and cost-effective advice. Orange County real estate lawyer Edwin Fahlen represents plaintiffs and defendants in lawsuits, arbitrations and mediations on real estate issues related to breach of contract, fraud, failures to disclosure, misrepresentation, mold, easements, encroachments, boundary line issues, fence disputes, view & tree disputes, title claims, construction defects, commission and escrow disputes, professional negligence, CC&Rs, COMMERCIAL landlord and tenant, foreclosure, co-ownership, financing, insurance, and other real estate related matters. Attorney Fahlen also advises parties in residential and commercial sales and real estate purchases including: reviewing and drafting of documents, deeds for property, sales or lease agreements, financing, easements and other agreements. 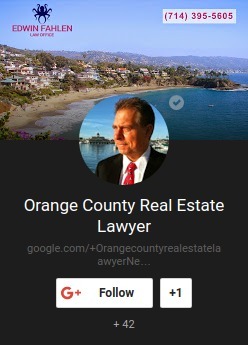 Orange County real estate lawyer Edwin Fahlen will make every attempt to resolve your real estate dispute outside of the courtroom but is fully prepared to litigate any case in the courtroom. Orange County real estate attorney Fahlen’s experience in adversarial proceedings includes trials as well as alternative dispute resolution which would including arbitrations and mediations. While litigation is usually undesirable because of time and cost, sometimes it is unavoidable. Orange County real estate litigation lawyer, Edwin Fahlen, has substantial litigation experience in state and federal courts as well as in administrative proceedings. Having the skills and willingness to litigate a case will often convince our client’s opponent to work out a fast and satisfactory settlement that saves Ed’s clients unnecessary time, costs and frustration. Attorney Fahlen’s decades of experience coupled with his skill and dedication have satisfactorily resolved thousands of real estate disputes for buyers, sellers, investors, developers, and real estate agents in real estate disputes involving enforcement of purchase agreements, nondisclosure of facts, nuisances, quiet title actions, easements, zoning and foreclosures. If you are a commercial landlord or commercial tenant, Edwin Fahlen has 30+ years’ experience helping commercial landlords and tenants resolve their disputes concerning drafting, reviewing, or disputes with commercial leases. Whether you are a commercial landlord or a tenant, Edwin can help you protect your interests or resolve your lease disputes and while keeping your checkbook in mind. Whether you are a tenant or a landlord, our office can help you navigate the process of terminating a rental relationship. Before you make your first move, you simply must know your legal rights. Contact Mr. Fahlen to get advice and representation with respect to evictions, unlawful detainers, and discuss the often-confusing handling of security deposits. Real Estate Opportunity or Dilemma in Orange County? At the Law Offices of Edwin Fahlen, we are well-versed in all areas of real estate. We understand that real estate transactions in the Orange County area are complex and involve the most expensive properties in the country. We are committed to ensuring that our clients have the reliable legal advice and assistance they need. No matter whether you are looking to purchase or sell real estate, begin an exciting commercial development, or facing a dispute or litigation, we encourage you to contact Orange County real estate Lawyer Ed Fahlen. With almost 30 years of extensive real estate experience, attorney Fahlen is here to protect your best interests. Edwin represents everyone from buyers to sellers, as well as brokers, agents, owners, lessors, tenants, and more. Have a specific real estate related issue that is troubling you? Call (714) 395-5605 today. We are ALWAYS personally available 24/7 to take your call. I encourage you to reach out to make that free introductory meeting with me by calling (714) 395-5605. There is absolutely no pressure whatsoever. Typically, people will want to sit down with a real estate lawyer to discuss their current opportunity or dilemma. I am pleased to offer this complementary legal service to residents of Orange County and beyond. If it is late at night or inconvenient to call me, please email me using my CONTACT US form on the left side of the screen. This form comes directly to my desk. I will contact you the minute I see it. We are located off the 405 Freeway. Here is a picture of my office building and a Google Map to get your bearings. Orange County real estate lawyer Edwin Fahlen services all of Orange County including the following cities: Aliso Viejo, Anaheim, Brea, Buena Park, Costa Mesa, Cypress, Dana Point, Fountain Valley, Fullerton, Garden Grove, Huntington Beach, Irvine, La Habra, La Palma, Laguna Beach, Laguna Hills, Laguna Niguel, Laguna Woods, Lake Forest, Los Alamitos, Mission Viejo, Newport Beach, Orange, Placentia, Rancho Santa Margarita, San Clemente, San Juan Capistrano, Santa Ana, Seal Beach, Stanton, Tustin, Villa Park, Westminster, and Yorba Linda. Free Initial Consultation with an OC Real Estate Lawyer 714-395-5605 There is no charge for your first lawyer consultation. We are ALWAYS personally available 24/7 to take your call.